» Articles » Sharp Tips » Do I Need To Replace Container Soil Every Year? Do I Need To Replace Container Soil Every Year? Is it necessary to dump "used" potting soil and add fresh soil to your pots every year? Probably not, but let’s look at some variables that can affect our decision. 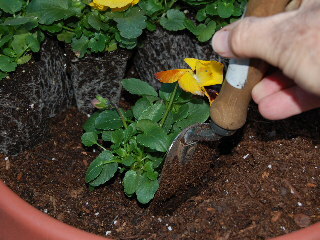 First of all, let’s consider the size of the container--a large pot with lots of potting soil in it that you use to grow fairly small plants (like pansies) should be good for several years before soil replacement is necessary. The reason being that most of the nutrients in the soil are not being utilized by the relatively small root surfaces that are interacting with only a small area of the soil. In cases like this, a good seasonal practice before setting new plants into your container would be to remove all traces of the previous season’s plants (including roots). Then thoroughly dig and churn up the soil in the container, mixing the deeper unused soil with the uppermost and partially depleted layer of soil near the top of the container. This practice is a good idea also in that it allows loosening of the soil, which will aid in the infiltration of moisture and air into all areas of the soil. This is also a good time to stir in some time-released fertilizer (like Osmocote®) and mix it well with the soil before adding new plants. Another consideration in deciding when to replace potting soil is the kind of plants (and their rooting habits) that have previously occupied the container. Tree-like plants (like poinsettia) and some vegetable plants (like tomatoes and peppers) can develop extensive woody or fibrous and matted root systems that can take over much of the container in a single growing season. In these situations, it’s probably a good idea to change out the potting soil each year before you add new plants. 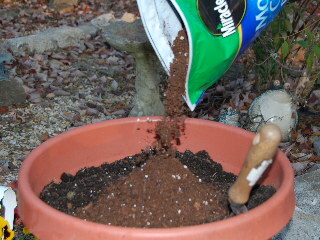 And, what can you do with the “used” soil that you need to dump out of your containers in order to add fresh potting soil? One solution is to remove all plant and root material from the container and scatter the soil into one of your outdoor planting beds or flower gardens before you re-mulch. There will still be some nutrients within the potting soil that will be beneficial to your outdoor plants. So, in answer to the question “Do I need to replace container soil every year?”, I would say not unless you have a small container occupied by lots of plants or occupied by plants that have extensive root systems. Just always keep in mind that you want plenty of “fresh” soil for your annuals or other container plants to be able to utilize.